Explore is a section for you to easily find pre-built lists and saved searches, all tailored to your region and topics you care about. The lists and saved searches here are curated and maintained by CrowdTangle. We are adding new lists all the time and updating others. You can bookmark these lists or simply visit them. Improved list search and categorization for the 2,700+ Explore Lists available across Facebook, Instagram, Twitter and Reddit. We consider your account's country of origin and region when surfacing lists to you, so you see what is most relevant to you and your work. Explore Lists will automatically update. We are regularly updating these lists, and if you've added them to your dashboard, they will automatically update when any changes are made. Say a presidential candidate drops out of an election: When we remove that candidate from an Explore List, the change will be reflected in every dashboard. Fear not, if you want to make changes to an Explore List, you can make a copy and start editing! New lists featuring underrepresented communities, such as LGBTQ advocacy organizations, para-athletes, and veterans groups. We have also added hundreds of lists in Asia Pacific, Canada, Europe, and Latin America in recent months. 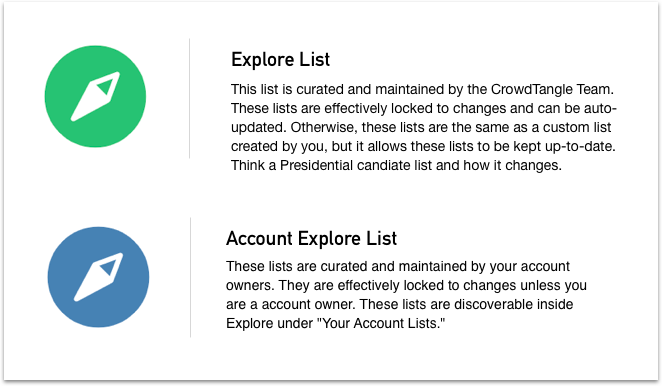 As an Account Owner, you can add any of your own lists into a customized Explore section for your account. 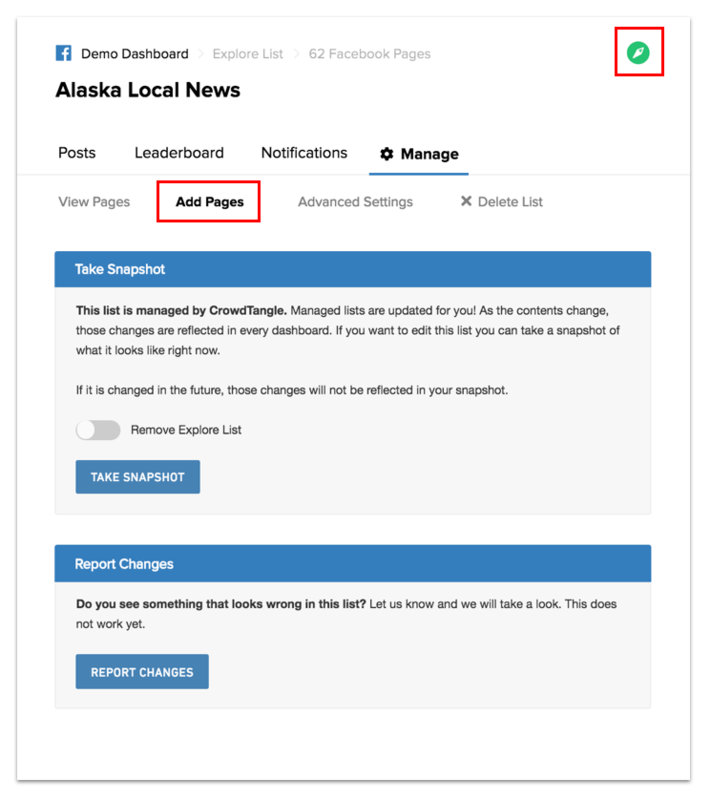 That way you can easily share lists and searches among teams and dashboards. This has the added benefit of locking the list from being edited by non-account owners. Q: How do you populate the Explore section? A: Our team is updating Explore with new lists and accounts all the time. We typically add lists around big events, such as awards shows, elections and big sports games, as well as continue to build out general lists in topic areas like news, sports, politics, local and more. Our team manually puts these together — if you have suggestions or see something missing, let us know! Q: Will you update lists and will I need to re-add them to my dashboard when you update them? A: Explore lists will now automatically update for you! For e.g. if a Presidential candidate drops out of a race, we will remove them from the Candidates List and it will reflect across all dashboards that have added this list to their dashboard. Q: How do you decide which social accounts get added to the lists in Explore? A: Our team builds these lists manually, the same way users create lists in their own dashboards. One exception is our Reddit Explore section, which was built via a special partnership with Reddit. The lists there are the most active subreddits in each of those categories. While we use our best judgment, do the research, and try to be as comprehensive as we can, these lists are by no means perfect. If you see any glaring errors or think something is missing, please let us know. Q: How can I recommend a list or search for Explore? A: We welcome your help in creating and maintaining these publics lists, so if you feel comfortable sharing one you've made that you think might be helpful for others, we'd love to add it. For example, one of our partners recently helped us create a public list of weather reporters on Instagram. Another partner helped us find more local news outlets for our New Jersey list. Shoot us a note at support@crowdtangle.com if you'd like to contribute or have ideas. Q: How can I get one of my lists into Explore so that it's accessible to everyone in my account? A: As an Account Owner, you can add any of your own lists into a customized Explore section for your account. That way you can easily share lists & searches amongst teams and dashboards. Here's how to do it: If you're an Account Owner, go to your list, advanced settings and hit 'Promote'. This has the added benefit of locking the list from being edited by non-account owners. If you're not an account owner but you've build a list relevant to everyone at your organization, please reach out to your Account Owner and ask them to add it. Q: What if I'm a Team Owner but not an Account Owner? A: At the moment, Team Owners cannot promote lists to explore. Q: How do I know who my account owner is? 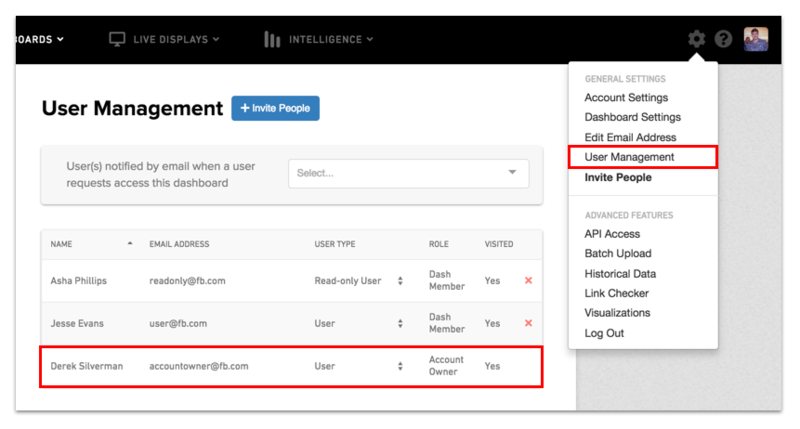 A: Go to your dashboard and open up the Settings Gear > User Management and you'll see your account owners. Q: How do I know which lists are from Explore and which are my own? create will not have an icon. Q: What if I want to see lists outside of my region or country? Q: If I see something wrong with a list, how can I report it? Email us support@crowdtangle.com or reach out via the chat button in your dashboard. In the near future, we will be adding a "Report Changes" feature so you help make suggestions and we can improve these lists quickly. Q: What if I want to make changes to an Explore list in my dashboard? A: First you need to copy the Explore list into your dashboard, then you can delete or add things to it. Once you do this it will be a unique list to your account, so please note, it will not auto-update if or when we make changes to the original Explore list. Q: Where can I access Explore lists?